Keep your passport safe for those holidays away with this fun passport cover. 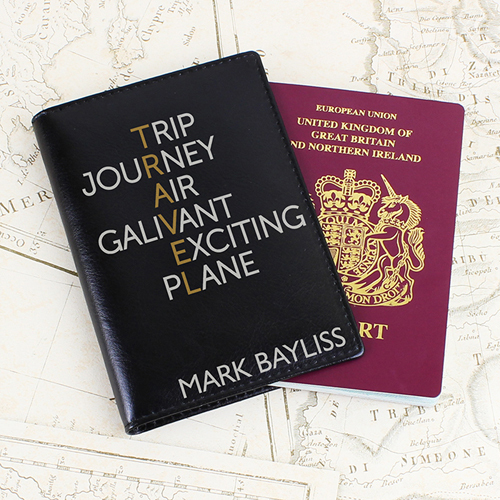 Personalise this Black Travel Passport holder with a name, surname or initials up to 12 characters. Entered personalisation will be produced in upper case. The following words are a fixed part of the design: TRIP, JOURNEY, AIR, GALIVANT, EXCITING, PLANE. The passport holders have two clear pockets inside to clearly display your passport. These items are made from genuine leather.